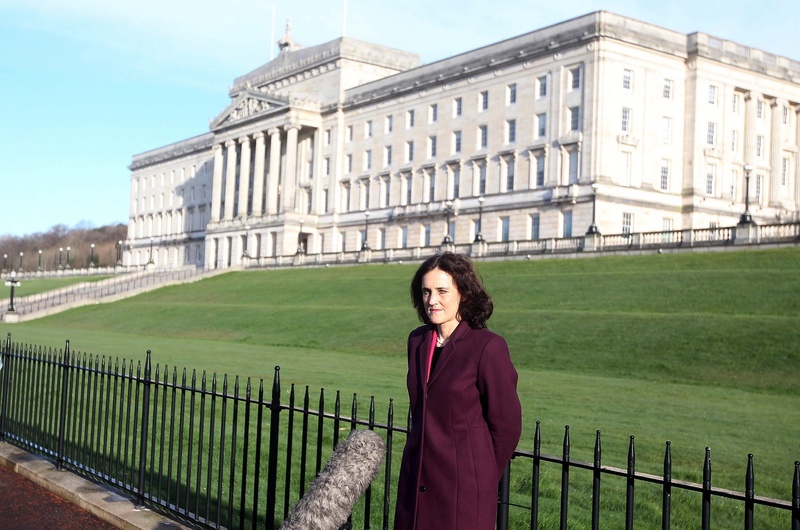 Secretary of State Theresa Villiers on a previous visit to the NI Assembly. THE Stormont Assembly, as well as the British and Irish governments, felt very remote from the heart of the peace process today. The message from ‘up on the hill’ was that the politicians were mired in fresh controversy over expenses bills. This came as Secretary of State Theresa Villiers confirmed that her political negotiations with the parties, which she recently signalled were going well, may be going nowhere just yet. The talks are aimed at reconciling Stormont’s budget crises, while tackling wider political stand-offs over flags, cultural issues and the legacy of the Troubles. Within hours the picture darkened further, with Sinn Féin claims that the two governments could be considering a narrower ‘take it or leave it’ deal that could collapse the Assembly. Renewed crisis could be around the corner. A few miles away from Stormont, however, people drawn from grassroots republican and loyalist communities met for an event at Belfast’s Europa hotel. The venue provided panoramic views of a city which has made huge progress in recent decades, but is now overshadowed by political stalemate. But he said the conference proved that those with “diametrically opposed views”, could still find a way to relate to each other. Victims, survivors, former prisoners and paramilitaries from a wide range of areas had taken part in the “Exploring the Past Together for a Better Future” project over the last three years. The project brought people together to share experiences and views on the past and the future. Their initial meetings had taken place in each other’s communities, where they walked each other’s streets and heard of their neighbours’ experience of the Troubles, of unemployment and often of poverty. A video featuring some of those taking part included young and old voices. “Nobody wanted to be there,” said one man speaking about those difficult initial encounters. But many agreed that “after it, you did examine yourself”. A former paramilitary recalled the events that drew him into violence and spoke of experiencing ‘atrocities in my community’ and of wanting to inflict ‘bigger atrocities’ in return. Participants said they were asked to listen to each other with respect, despite fundamentally disagreeing on issues such as identity. The PEACE III funded project was part of the Bridge of Hope programme, delivered by the Ashton Community Trust in north Belfast. In addition to the cross-community contacts, it sought to also draw on the international experience of those working to rebuild community relations in Berlin. Some of the participants visited Germany to experience a society which had suffered its own historic trauma. Berlin’s efforts to deal with its divided history were previously reported on by The Detail here. Stormont Junior Minister Jennifer McCann addressed the Europa event, discussing what she said was the need to deal with the past in order to build a better future. She left to attend the Stormont negotiations where dealing with the legacy of the Troubles is on the agenda, though they are the same talks that the Secretary of State now gives slim hope. After the Junior Minister left, the leader of the Progressive Unionist Party Billy Hutchinson reminded the audience that the negotiations were not “all-party talks”, as loyalists were not included. He too spoke positively about the importance of grassroots work and the common experience on issues such as social disadvantage. The keynote address was by Beatrix Austin from the Berghof Foundation in Berlin, part of an organisation that has been involved in international peace work for decades. She drew comparisons between the Belfast experience and areas such as the Middle East and elsewhere in Europe. But addressing what she termed the ‘elephants in the room’, she recalled how one of the organisers of the Belfast project had “put an empty chair up to the table where people were dialoguing”. The empty chair represented the absence of the government. Ms Austin said: "Sometimes the governments, those actors who are in the background, that are not present in our dialogue, can really make us feel as though we’re just not going to be quite enough, no matter how much we all try. The questions of money and dialogue, which were both on the agenda at Stormont, had found a different expression. Who is kicking our tyres?